One elemental rule that governs every living being’s life here on this planet regardless of culture, race, beliefs, species or wealth is time. We are all bound to use whatever amount has been allotted to us while we are living. Time cannot be domesticated or controlled, the only option we have is to capture it and reflect upon what that particular moment means to us. 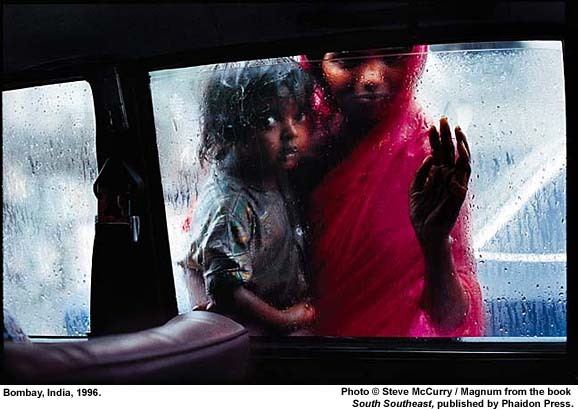 This is the business of men like Steve McCurry. 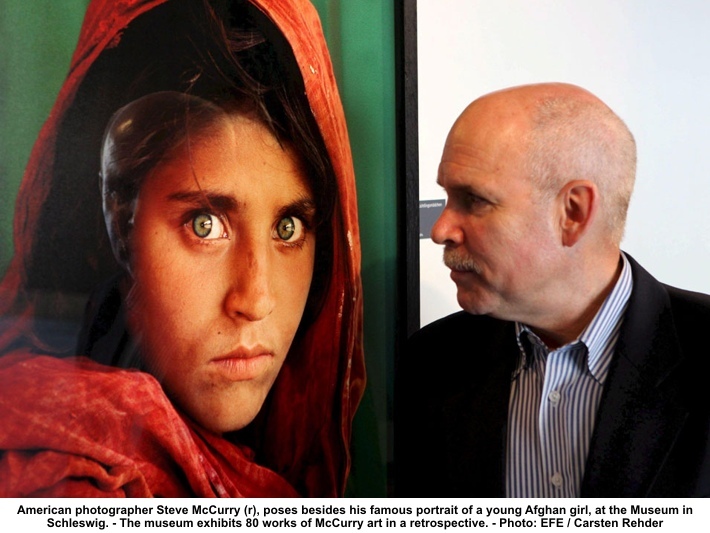 Steve McCurry has been at the “ground zero” of photojournalism for nearly thirty years. His timeless works have captured the distant lives and faces of those whom we would never normally see in our lifetimes. His subjects are foreign to our Western eyes and their customs are distant and intriguing but if you set aside these differences in appearance and custom then we can clearly see, perhaps most clearly of all, ourselves. Why do these photographs continually spellbind us so? How is it possible that simple reproduced picture can have an impact the travels far beyond the aesthetic and into the very psyche of the viewer itself? Do these personal scenes ask something from us? And if so what do they want to convey? “A picture says a thousand words” is a popular cliché that is used almost to the point of meaninglessness, but what if a single picture really can tell a person’s life story? What if it could speak to us? What would it tell us? In this world of “life in the fast lane” and instant gratification we go through our days without the slightest stray thought about all of the other places, cultures, struggles and triumphs that happen in the world. In its place we “multitask” and “teleconference” to comply with “deadlines” and “enterprising opportunities”. World renown and respected photojournalist Steve McCurry captures these images with an eye for beauty and substance that has few equal. He has routinely developed some of the most haunting and introspective views into the lives of people from all over the world in various states of living; power, despair, love, death, and hope. His “eye” chronicles the lives of those whom we would never have seen or given thought to and demands we face them and in that moment share something that is so intimate and delicate, we share ourselves. How can a mere portrait made from paper and various chemicals cause such an internal stir within us? McCurry’s motivation is from the perspective of both a dedicated artist and a historian. As a historical chronicler he must assert himself into the very crux of where history is taking place. He possesses a true passion to reveal the unspoken side of historical event s and give both a face and ultimately a voice to the “unseen” participants that often get swept up into histories path. This human oriented spirit lends itself to his true expressive powers as a photographic artist. As a photographer, McCurry so wholly becomes one with his subject that he is then in a unique perspective to be surrounded by people who are unaware or detached from what he is doing and carry on their lives as normal. From this vantage he is then free to capture the images that can easily define a region or at the very least bring attention a situation far better than any figurehead or mass communication could vocalize. I believe these images of simple and oft time’s impoverished people are meant for the ones who are merely unaware of their existence. For me, I felt that his work reaches its maximum potential with those of us who have more benefits and luxuries in life than the persons pictured. I think his work is meant for core nations in the western world primarily. These personal and engaging portraits would likely have little effect if they were shown to someone who is, for instance, the neighbor of one of the subjects. His work does far more to those who upon viewing them can take a long and calculated look into the alternative versions of human life that are not so easily seen from the vantage of an office desk or from a computer screen and then be stripped of their comfort and have to be face to face with someone in such a personal way. This proves to have a cathartic effect on the viewer in that throughout their plight or struggle or poverty they still have the same basic needs and desires as anyone else. In this way McCurry lets us all know that there is a big world out there and we are only after all a small portion of it. Marshall McLuhan once said that the “medium is the message” and in that context I do not believe there is a decisive difference between both journalism and art because they neither can exist without a usage of the other. Art is a form of journalism in that it reports a thought or sentiment that is captured in the mind of the creator andrendered onto the chosen medium. Art more than anything else can exponentially magnify the emotional meaning and intent of any piece because of arts nature to “speak” to a portion of our mind that is not overtly accessed by the hearing or reading of words. It can play on our fears, fill us with joy and love or leave us moved and saddened. These intrinsic qualities are what make it so valuable to this end. Solely reporting without the usage of some kind of iconography or thematic visual aid could not deliver the same message with all the intent that the writer, or editor would have devised. This is not to say that writing by itself cannot create a similar situation in one’s mind through the use of creative and strategic word choice. but as a visual creatures something very personal happens when we are shown a glimpse into art. They framing of the artists work is the crucial component that makes it as extraordinary and powerful as it is even fifteen or twenty years later. 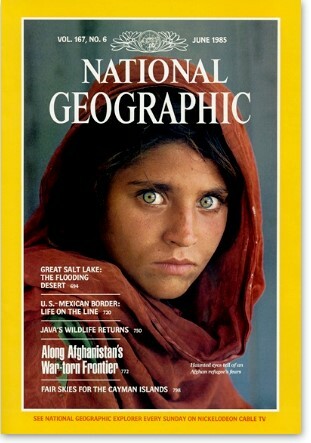 McCurry’s technique gives the viewer enough surrounding information to provide the basics of a back story for the subject but not enough to really know definitively. This is accomplished by the proximity of the subject in the portrait. He puts us (the viewer) closer and more intimate than we would likely be with almost anyone except our family and loved ones. He somehow pireces our comfort zone and leaves us no choice but to partake in the exchange. We cannot be protected by our status, or prestige and we must meet and engage this person on equal terms. The realization that this is a real human being that did not rehearse this picture or do anything other than be at this place at such a specific point in time somehow burnishes a feeling of concern or worry that they are safe and not in need almost the same way you would care for a family member. His pictures take away the defensive walls that humans build and let us see each other in the “unguarded moment” as Mr. McCurry says where very real feelings of compassion and kinship spawn for each other on a species level. After viewing this exhibit my idea about his work has changed tremendously and I am deeply satisfied that I have had the chance to view this exhibit and formulate these conclusions.